An official Pi Kappa Alpha (Pike) fraternity house was under construction while the group was suspended for violating university standards in 2013. 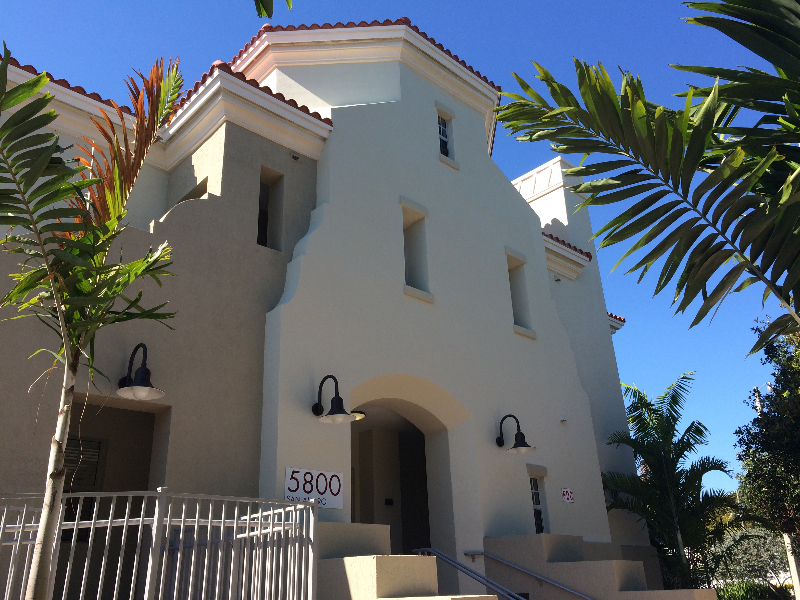 Located on 5800 San Amaro Drive near the University Village apartments, the property is completed and will be leased to the Beta Theta Pi (Beta) fraternity. Two weeks ago, the Division of Student Affairs sent an email to all students regarding Pike’s suspension. The fraternity is supposed to return to campus in 2017, but recent allegations that they are continuing to operate as an underground organization have put them under hot water with administration. The message, which focused on the group’s status as a Greek organization, also stated that the house built on San Amaro Drive is not owned by the university. “This is not a UM owned or operated property and there is no full-time, professional, or graduate UM-affiliated staff providing oversight of the property,” the email stated. But because the house is on San Amaro Drive, it is part of the extended campus area. In 2010, a zoning ordinance reassigned all properties on San Amaro Drive from single family residences (SFR) to a university campus district (UCD). However, this does not mean that the house falls under the jurisdiction of UM Police. Likewise, Justin A. Buck, executive vice president and CEO of Pike, said that the house is not owned by their national headquarters. “Pi Kappa Alpha Fraternity does not own the property at 5800 San Amaro Drive,” he wrote in an email statement. It is, however, owned by a company called West Range Coral Gables LLC, whose corporate officers include Pike alumni. Buck also said that those alumni have maintained contact with the fraternity to execute projects at the house. According to Buck, Pike nationals have owned the property since the 50s. Around 2008-09, the previous house was demolished and Pi Kappa Alpha Holding Corporation sold the land to the company that owns it today. The renovated house has been available for rent to UM students this semester. According to Beta President Jack Miya, whose fraternity will be leasing the house starting next semester, Beta has been occupying a floor in the house this semester as well. Though there are still apartments available for students to rent, the house will be turned over to Beta on July 1. “It’ll be the Beta Theta Pi house. We even have letters on the house; it’ll be fully our own,” Miya said. Beta’s long-term lease will extend to 2017, when Pike will be eligible to petition to return to campus. As far as Pike’s plan for the property if the fraternity is not reinstated, Buck said that it’s a decision that will have to be made come 2017 or thereafter. “There are a lot of variables between now and then that we don’t have the answers to,” he said. According to an article published in The Miami Hurricane, Pike’s Chief Real Estate Officer Dan Corah said the house will not be automatically given to the re-established Pike chapter, even if they do return to campus. Corah said that new members will have to take the time to “establish themselves and get organized” before they are allowed to take control of the house. As for Beta’s role during the possible transition, Miya says that there may be a possibility of renewing their lease if Pike is not able to return. According to Miya, Beta nationals do not actively fund houses for their chapters. That, along with the fact that there is little area surrounding campus, are the reasons the fraternity was not able to get a house sooner.